Updated 10 May 2017. HLS adaptive streaming requires various playlists (m3u8 manifests) to serve various bandwidth versions depending on the internet connection of the visitor. 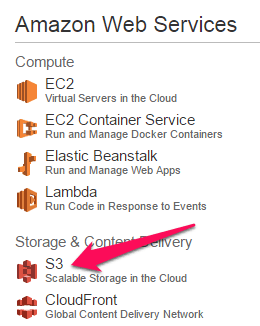 These manifests are created via the Elastic Transcoder service in the AWS console or via a video editor. for this reason, the manifests are static files, therefore, you can normally only create public video's as opposed to the other formats. However, there is a small loophole we found: You can keep the bucket and the files private and only make the distribution public. In the distribution set up, you can force all links from the bucket to use the distribution link. That way the files remain safe in the bucket, although they are accessible via the web distribution. Because HLS exists of video segments of 10 seconds each, illegally downloading them is quite a job, therefore the risk of stealing is somewhat diminished even if the web distribution is public. Although HLS can be set up to play in Flash mode, it is best to serve it via HTML5 using CORS headers because Flash will be deprecated by most browsers quite soon. The fist thing you need to do is to follow this tutorial to set CORS headers in your bucket and web distribution in order to make the HLS segments HTML5 compatible. When you have done that, come back here and proceed. 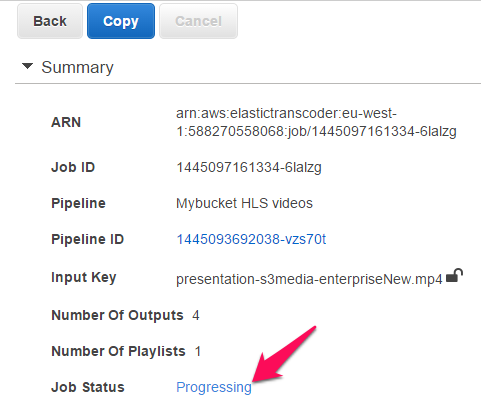 Although you can create video segments with a video editor, Elastic transcoder makes life easy for you by creating the segments and the relevant manifests in one go. It also goes exceptionally quickly. A private bucket that contains the master video you want to process. A private bucket for the output of the video in segments and manifests. mybucket-input (private) > used for master video's. mybucket-hls (private) > used for video segments and m3u8 manifests. We are going to upload a video now. This should be a MP4, codec H264, AAC audio. It can be a 360 VR video as well. Best use a video with minimal compression, because once we start processing the video for HLS streaming, more compression will be applied and this seldom gives good results. 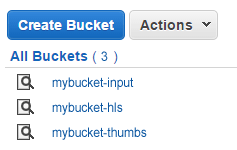 Select the mybucket-input bucket in that list. Your bucket has of course another name, but to keep it simple, we refer to the naming convention outlined above. Don't navigate away from the page until it is done, although you can do other stuff on your computer in the meanwhile. Once the video is uploaded, it is automatically listed on the left. 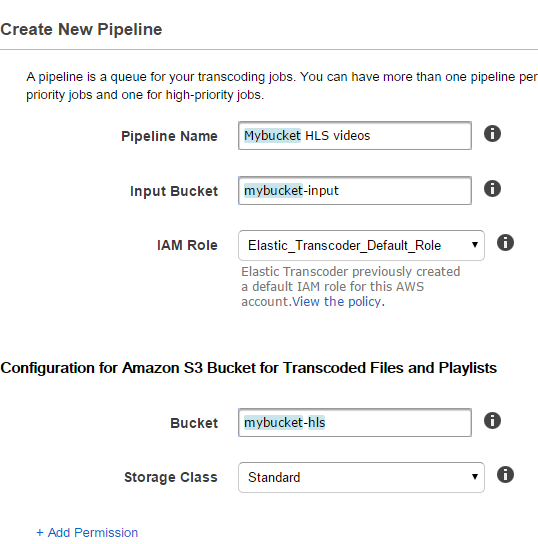 We we are going to use Elastic Transcoder of AWS to convert that video in chunks of 10 seconds which will be placed in the other bucket. Elastic Transcoder is an online video and audio converter with many options. 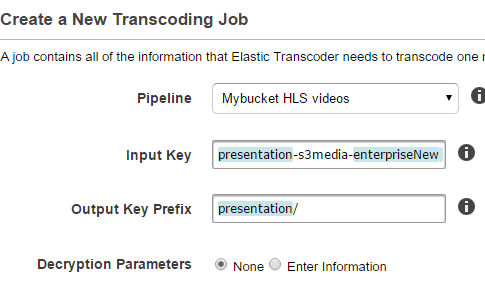 Although you can use your own video editor, Elastic transcoder is very fast and creates the m3u8 manifests for you. Create a Pipeline, which determines the input and output buckets and the Preset to use. Create a Job, to break up the video in segments and create the m3u8 manifest in one go. If that sounds like Chinese to you, don't worry, all will be explained. Possibly, you have already Pipelines setup, which are listed on the right. But for HLS Streaming, we need to setup a new one. 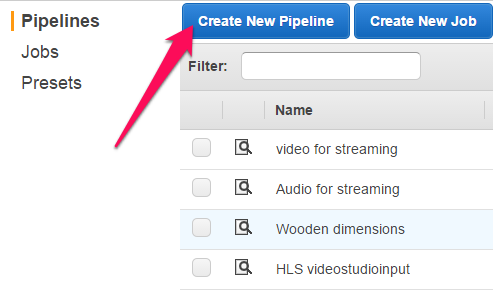 Click the Create New Pipeline button. Pipeline Name: Give this a convenient name to remember. Input Bucket: When you click in the field, you get a dropdown with buckets. Select the input bucket which contains your video. IAM Role: Leave as is. If you don't have one already, it will be created for you. Bucket: is where the converted segments of the video and the m3u8 manifests are placed. In our example mybucket-hls. Storage class: Standard. Other options are not useful in this case. This follows the same rules as previously described, except that you select the mybucket-thumbs bucket. To be honest, it is often better to create a poster image by hand and upload it to any bucket you like (as long as the image itself is made public). But the method above may speed up things for you. Scroll down and on the bottom right, click on the blue Create Pipeline button. The next thing we have to do is create a Job. This is where everything is going to happen. With a Job, you create the video segments and the m3u8 manifests. Pipeline: Slect the one you just created. Input Key: Select the video by clicking in that field to open the dropdown box with existing videos in the mybucket-input bucket. Output Key Prefix: This is used to organize the video segments and manifests in its own folder. Note the slash at the end. Preset: The system HLS presets are fine. 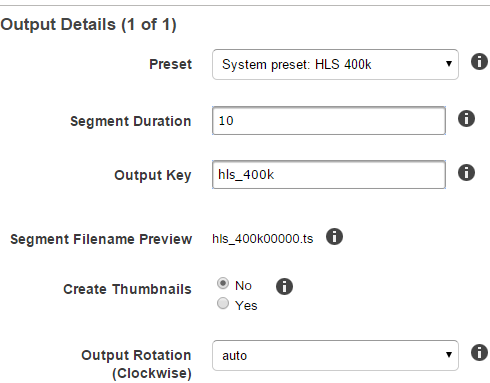 Select first System preset: HLS 400k. Segment duration: Apple recommends segments of 10 seconds. You can change that if you like, but this is the ideal length. Output Key: Give a prefix for each segment. Since you chose the 400 kbs bitrate preset, indicate it more or less as shown. Segment Filename Preview: is a preview of the segment names influenced by the previous field. Create Thumbnails: Leave it to No, this resolution is not good enough to create a poster image. A new group of Output Details shows up. Repeat the same as previously, but this time select System Preset HLS 600k, Segmentation: 10, Output Key: something similar like hls_600k. 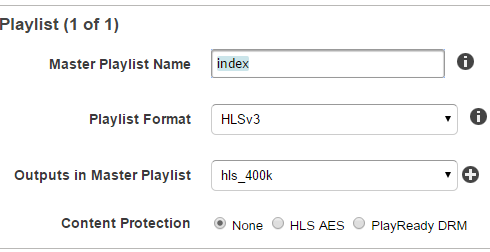 Add another one and select System Preset HLS 1M, after that create the last one with System Preset HLS 2M. With this done, we create 4 formats in one go, respectively 400k, 600k, 1MB and 2MB bitrate segments, all neatly named according to the Output key prefixes. But we are not done yet with this Job. We have to create the manifests as well. Master Playlist Name: Usually we call this index since it is the master manifest which will call the others. 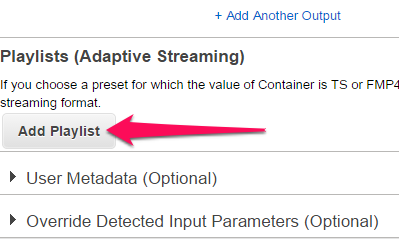 Outputs in Master Playlist: Select first the 400k version. 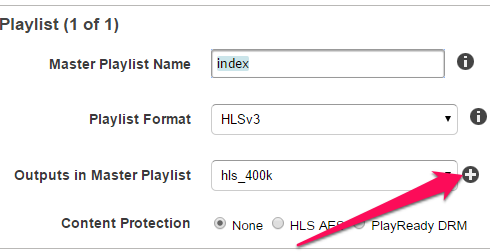 This time, select hls_600k, then repeat this until all 4 formats are included. This will create separate manifests for each bitrate version. Then scroll down until you see the blue Create Job button. Click on it. With the example video I used, which is 7 minutes in length, it took about 5 minutes. You can refresh the screen from time to time to see if it is finished yet. If the status is Complete, the job is done. You can check the bucket, to see everything is there. 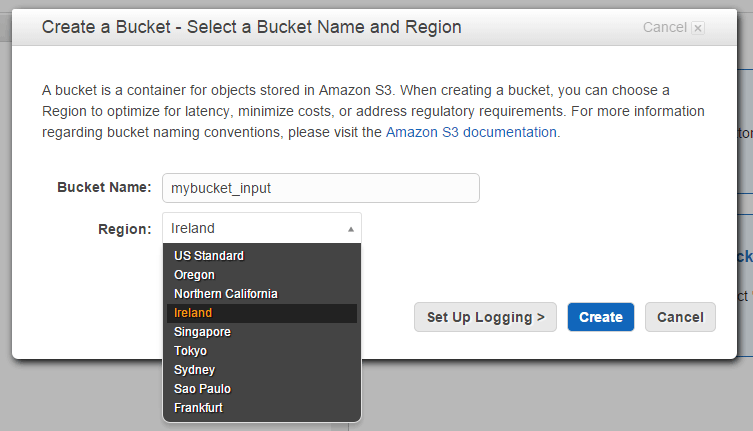 Go to the S3 service and select the bucket which should contain the video segments, in this example mybucket-hls. You will notice that there is a folder with the name you designated in the Output Key Prefix. Click on the folder to open it. There should be a a whole range of .ts files and .m3u8 manifests. The one we will need is the index. m3u8 manifest to load into the player. Since we have setup the bucket and web distribution with CORS headers, we don't have to rely on Flash, hence we don't need to create a crossdomain file. 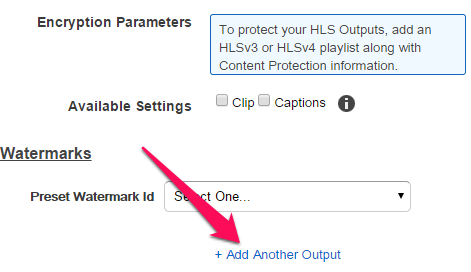 We are ready now to embed the HLS adaptive streaming video. There are two ways to insert a progressive download video in your posts and pages. Either use the wizard or write shortcode. We recommend to start with the wizard since it generates the shortcode automatically on the spot where your cursor is currently located. From there you can customize the shortcode if you like. To start, go to the page or post where you want to place the progressive download video. This brings up the Wizard with a whole range of options. (Click on the image at the left for a full overview of the options). Every option has a handy hint reminder when you hover over the label of a field. Depending on the media type, some fields may be grayed out as they have no use for that particular media type. If you have already set default options, you can use these and only fill in the fields which are needed for this instance. This will show at the top of the video area. Although optional, it is good for SEO. Leave Title empty if you do not want this. Note that in the screenshot above, you see (Default: dxxxxxxxx) next to the Web distribution field. This is because I have set a default value in the Default options. I could leave this field therefore empty, but it can be overridden as I did here. Note that this attribute is called HTML5, which relates to its previous function as a HTML5 fallback when Flash was predominant. Generally, you want to use another bucket with full private web distribution for those fallbacks. Not strictly required if you only use the media file only, although it will still play with an expiring URL. When you se the source2 and source3 fields, this field is required! The extension presumes you uploaded the poster image to your domain. Only add the name of the image in this field, unless you placed it in a sub folder. If so, add the sub folder as well. You can override the domain setting by using an absolute path starting with https://... if the poster image is located somewhere else. In that case, you need to place a crossdomain.xml file in the folder where the poster image is located on the external domain or a bucket in AWS. Images can be .PNG, .GIF or .JPG. Use .GIF or .PNG or flat colored graphics and desktop screenshots. Use JPG for photos or artwork with many gradients. Standard set to Show. Contrary to JWplayer 5.10, the controlbar can not be made sticky to the video player. It behaves in the same way as on YouTube now. If set to Show, the controlbar shows when the user moves his mouse over the video area. It will disappear after a few seconds. Shortcode: skin="hector_video" (whereas hector_video is one of the possible skins). In short, the subtitles need to organized within a main folder like for example "subtitles" and then for each video, you create a subfolder so that only the relevant subtitle files are listed for a particular item. Standard set to No. Sharing places an icon in the video area to share the page to the video via social media. It is not available when you have no valid JWplayer license. The optional field Heading.This field is useful if you want to translate the standard heading "Share video" into another language or customize that text. In the example above, we filled in "Share audio" since the screenshot comes from an audio. Leave empty if you want to use the default. Usually a logo in .GIF or .PNG format. You are not restricted to logos. This can be any sort of image, but keep in mind that if you want it to show up semi-transparant, you need to use css, either in your custom skin or the theme css of your site. Example: myWatermark.png is the image and tutorials is the sub folder, this becomes: tutorials/myWatermark.png. .PNG and SVG tends to give the best results. You can override the domain setting by using an absolute path starting with https://... if the watermark is located somewhere else. In this case, you need to place a crossdomain.xml file where the watermark is located. Prevent screen capturing. Tests with subdomains on our server failed and we couldn't find the reason for this yet. Does it work as you expected? Congratulations! If you place a lot of videos in the same bucket, you can copy the shortcode from your page/post, change the name of the video, while leaving the rest as is and put it into another post/page. That way you can work even quicker. If you have problems, check that the shortcode does not contain formatting code or has an active link. Sometimes, an absolute URL turns into a link. Unlink it, otherwise it will not work. Be sure you filled in the correct JW Player license key in the settings of the plugin or it won't work. Still problems? Check out the FAQ first. If that does not help you, contact us here. Please let us know which software version you use, the WordPress version and a description of the problem. Providing a published page/post with the video would be a good idea as well. On some WordPress configurations, the wizard doesn't show up. In that case, refer to the Shortcode list or ask us to prepare a sample shortcode for you.